PASTELOGRAM is named in honor of the poet Marianne Moore, who was commission- ed by Ford Motor Co. in the 1950s to come up with names for its new mid-priced car. 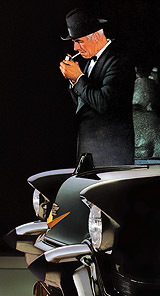 Among her suggestions: “Pastelogram,” “Turco- tinga,” “Silver Sword,” “Resilient Bullet,” “Utopian Turtletop” and the especially cryptic “Mongoose Civique.” Ford declined to use any of these and instead went with “Edsel.” The rest is history. of requests asking the Curator: “You’re so darn modest, we don’t know much about you. How about posting a picture or some biographical info? And have I told you about the time I was abducted by aliens?” Well, you get the idea. So here’s a little about our history. The old Patent Office applications in the PatentRoom are a soft- serve lesson in history. New on the menu: Tees. The early aircraft designs on view at AdventureLounge will take you back, though maybe not all in one piece. THE ART of Josh Agle. Martinis, girls, guns. Think James Bond meets Jetsons at a tiki bar in Palm Springs. This year people are flying United Air Lines at the rate of around a quarter of a million passengers monthly — a new winter record. 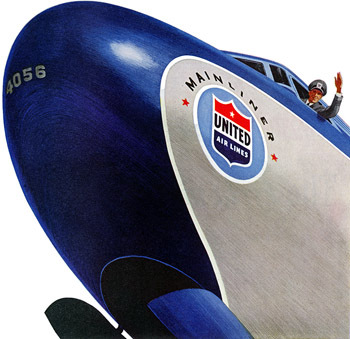 While other forms of travel have been increasing in cost, United’s fares have stayed within about 4% of the 1941 level. Yet your United Mainliner ticket represents a far greater value than it did then, with almost twice the speed . . . larger, more spacious, more luxurious planes . . . improved schedule dependability . . . finer meals . . . Wherever your travels may take you this holiday season, Plan59 wishes you short lines and empty adjacent seats. Candy’s such a delicious quick-energy food! Tastes so good . . . looks so good — especially when it’s packaged in sparkling cellophane. Cellophane keeps candy clean and fresh, lets you see to choose exactly the kind you want. 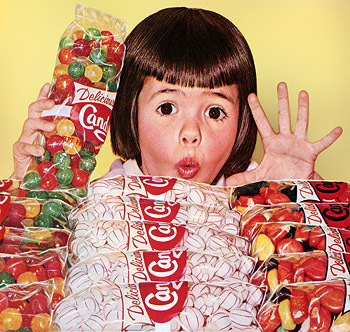 Many candies now come to you in Du Pont “K” cellophane — for greater protection. Look for the extra sparkle! Candy’s at its best in Cellophane! We've found our next Demonic Tot! For reasons that are lost to history, the cellophane people had an especially scary cast of kids. Road speed, 40 miles an hour. But he’s reaching home with the speed of light — via his dial mobile telephone. 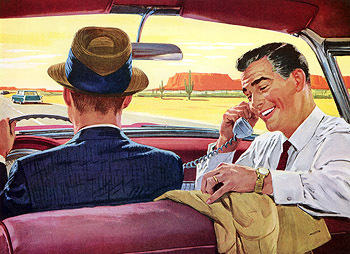 A few turns of his dial connect him, by radio, to the Telephone Central Office. The land lines put him right through to his wife. Mobile telephone service, with dial convenience and speed! The Mobiltel Automatic System which provides this new dial service was created by Lenkurt and Automatic Electric. It is just one of the advances made possible by our telephone engineering — advances extendimg far beyond the communications field. In industry, our versatile relays and switches are the “heart,” “brains” — yes, and “memory,” too! — of thousands of automatic control systems . . .
And right around the corner, just up the road, turn left at the second cactus — TVs you can hang on the wall like a painting. Another Christmas — and what pulse won’t quicken as the day draws near? To give this day a very special meaning, there is no gift like the gift of time — a watch, a symbol of the time that’s gone before and the time together that’s to come, echoing “Merry Christmas” through the year. For a gift to cherish — none is more perfect than a watch . . . 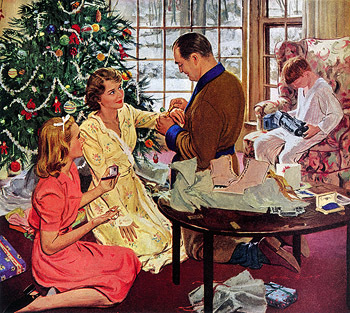 The illustrator of this Christmas morning scene from 1948 is Austin Briggs (1909-1973), among the most successful commercial illustrators of the 20th century and one of the founders of the Famous Artists School. In the 1930s and 40s he drew the Flash Gordon and Jungle Jim comic strips. 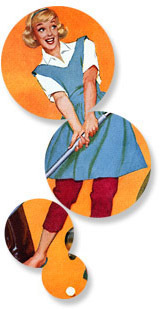 Today, each factory worker in the United States has at his service six horsepower. This is much more than anywhere else in the world, and three times as much as we had just fifty years ago. With this power, workers produce more goods than anywhere else and earn more. Power is the heart of our industrial strength. This tremendous edge in power is supplied largely by American gas and electric companies . . . 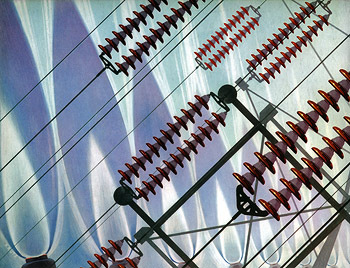 This interesting juxtaposition of gas flames and electrical insulators comes to us from 1951 and an artist named Kautz. 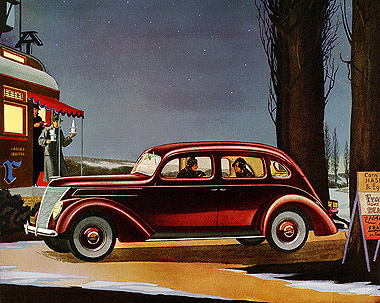 The 1937 Ford is very modern — even advanced — in appearance, comfort, safety and other important features. But it brings you old-time Ford economy and the lowest Ford price in years! The new 60-horsepower V-8 engine makes this possible. First built for England and France, where fuel costs are high, the “60” engine has been thoroughly proven. Now optional in five body types, it delivers V-8 smoothness up to 70 miles an hour, and goes farther between gas pumps than any Ford ever offered. The 85-horsepower V-8 engine, brilliant older brother of the “60,” has been improved for 1937 and gives unusually good gasoline mileage plus the smooth speed and split-second acceleration for which Ford cars are famous. You may take your choice of these two V-type 8-cylinder engine sizes, 85 horsepower for maximum performance, 60 horsepower for maximum economy. Both engines are built into the same big, roomy car — THE QUALITY CAR IN THE LOW-PRICE FIELD. Note how the artist (who is he?) has pointed the V-8 insignia on the wheel covers forward. What we wouldn’t give to be at that diner right now! Hash and two eggs over easy, please.